This week I spent about six hours over the course of two days dealing with the Ministry of Labor, renewing my work permit. That, about US$100, and the non-immigrant visa I received last summer while in the US, was enough to clear my way for another year of legal residency in Thailand. I guess in the big picture this is a small price to pay to live with my husband, but it seems to me that people shouldn’t have to jump through so many hoops on an ongoing basis in order to live with their spouses. Jumping through hoops initially for immigration purposes, I can understand that. But every year from now to eternity? Rubbish. Anyhow, at least I received a full year on the work permit instead of only ninety days at a time, which is usually the case. However, with the type of visa I have, I still need to do a border run (leave the country) once every ninety days, despite having a full year visa. Try to figure that one out. One sign that life is back to normal in the City of Angels is that construction continues unabated. In the picture above, you are looking northwest at the Asoke Road / Sukhumvit Road intersection towards the new Terminal 21 mall. I wrote about this construction project in November, when they were laying the ground floor after a year of work on the foundation and understories. Six months later they are on the ninth floor, which is as high as the mall portion will go. 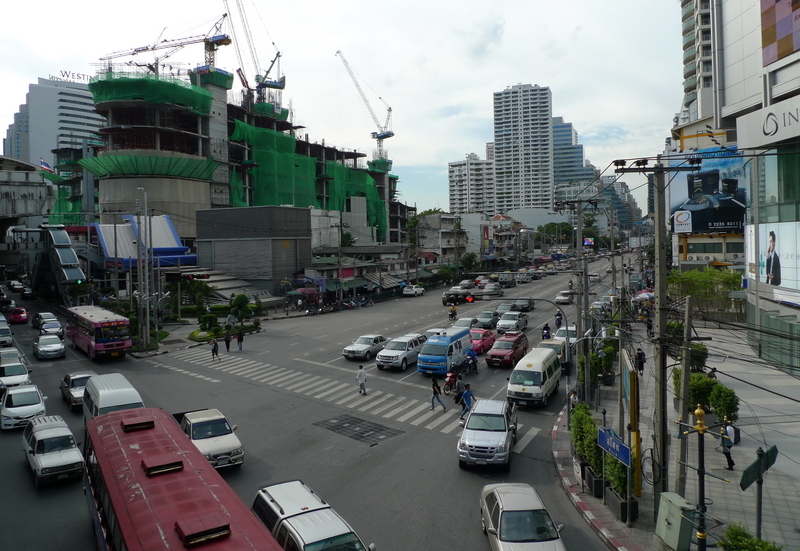 Another view from the Asoke Road side. Pretty soon the street will be shaded in the afternoon, once they add just a few more stories. The back portion of the property will have highrise component which will include a service apartment complex and office space. Do we need another mall in this city? Probably not, but at least it is further east than most of the malls, which are in the Siam Square area. This provides an option for those of us on the Sukhumvit corridor to avoid going all the way into the city. I’m actually surprised by the amount of construction going on in this city, especially new condos. A few weeks ago I drove from our house at Sukhumvit 53 to the Nissan dealership at Sukhumvit 101/1. This is about six stations down the Skytrain line, only three of which are currently operational, the remaining ones scheduled for operation at the end of 2011. Around every single station, both the current and future ones, there are three or four large construction sites where highrise condos are being built. Can there be that much demand? It must represent investors’ confidence in Thailand. 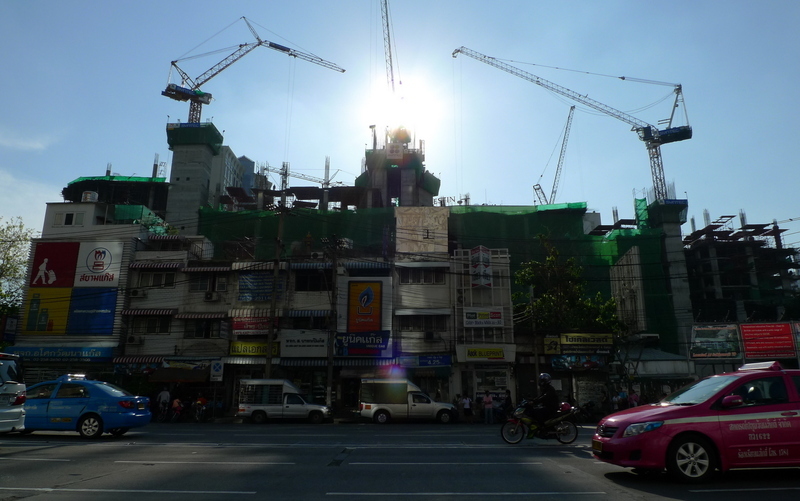 From highrises to sidewalks, inane utility work continues in Bangkok like it does in much of the world. Why is it that there never seems to be any coordination among respective agencies? A new sidewalk is built and neatly paved and then as soon as that is finished, a utility department comes along and digs it up. 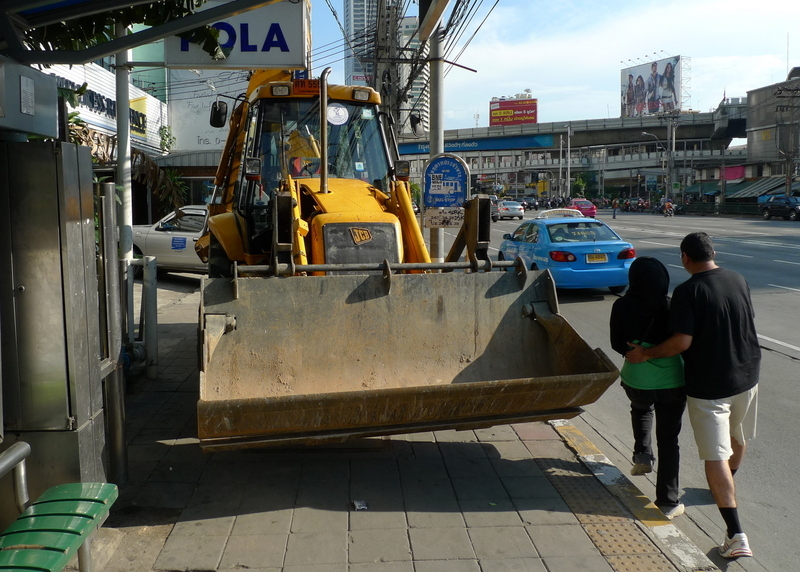 The same is true along Asoke at the entrance to Soi Cowboy, where there was a large backhoe parked on the sidewalk for several days (anyone want to walk in the gutter?) 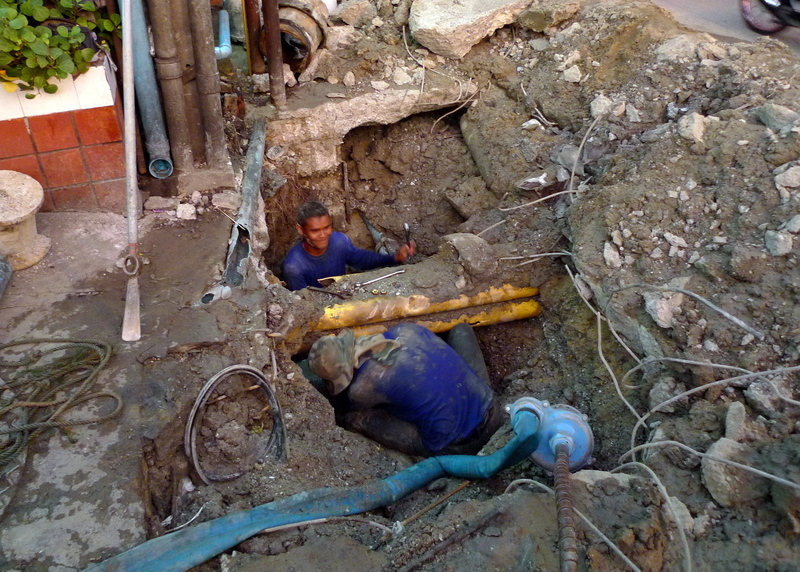 as about five meters of the sidewalk was dug up and water mains were repaired. I felt bad for these guys, the ones doing the actual work. What a messy job. As you can imagine, there’s not much rhyme or reason to the way utilities are laid out in this city. Sometimes they don’t even bury them, but lay them on top of the existing sidewalk and just spread some asphalt over the top, a snake running along the sidewalk, waiting to trip you. This entry was posted in Uncategorized and tagged Asoke, Bangkok, Construction, Sukhumvit, Terminal 21, Thailand, Utilities by christao408. Bookmark the permalink. Yeah, I would feel bad for them too. There’s no way that can be construed as fun. If you think that is unorganized- wait till you see this city! I am happy that prosperity and stability returns to Thailand. If you don’t mind me asking – could you apply for full citizenship, in Thailand? Do you want to? Seems like it’d be simpler than continuing what you’re doing, if you’re planning to stay forever. It must be universal – the utilities work. Here they worked for years to get an extention of a road done to connect north and south. They paved and oops! had to dig it up – forgot some part of the sewer tile connection… by the time the road opened it had multiple patches from having been dug up..
I’m still scratching my head over the border run with the full year visa. It’s kinda sad to see towering developments that rob the city streets of sunlight. It is interesting to see how other parts of the world are developing. I find that utility infrastructure is usually haphazardly thrown together when the city is in the beginning stages. Kind of wish they’d do it right and plan it all properly the first time, since down the road… it’ll be quite a headache for future developments.For example, when I worked with the region of Niagara (Niagara falls area), they were finding old sewer lines that weren’t documented anywhere, and they have no clue where they were going, or what they were connected to… but they were running anyways. @Passionflwr86 – @yang1815 – I don’t mind you asking at all. Full citizenship is a near-impossibility and permanent residency would require something like the following (as described to me once by a lawyer): You can have lived here fifteen years, be married to a Thai, have half-Thai children, own a large company that employs many Thais, work with many charities, have recommendations from Thais in powerful places, speak, read, and write Thai fluently, and maybe… MAYBE you will have a shot at permanenet residency. That said, if I could get permanent residency, I would. However, in another ten and a half years I will be 50, thus eligible for the retirement visa which makes it pretty easy to stay here. @TheCheshireGrins – Welcome to the pretzel logic of the immigration department…@AzureRecollections – Wouldn’t it be nice if they could have a Paris- or Washington DC-like moment where a large swath of the city is all planned at a single time? @ElusiveWords – As strong as the sunlight is along that particular stretch of street when I walk to my Thai classes two afternoons a week, I’m actually thankful for a little shade! I know, not the right answer from an urban development standpoint, but there hasn’t been anything green on that stretch of road for years, so it isn’t like the sunlight does anything but absorb into (and reflect off of) the pavement. @choyshinglin – Well, I hope it has returned for a lengthy stay…@Dezinerdreams – Yeah, anytime I write about something kind of chaotic or strange here, I remind myself that there’s always India. Incredible India! @Paul_Partisan – They were really friendly, though, smiling for some of the pictures I took. @Redlegsix – Important for them not to state a year. That way they have a lot more flexibility! @christao408 – Yikes didn’t know it’s that hard to become a permanent resident/citizen there. @lcfu – In the end, it always seems to work out here, doesn’t it? @yang1815 – Truthfully, it is a near impossibility. That’s one reason I’ve been a bit agitated over the slow pace of change in immigration and marriage laws in the US. Would like to have a place where we can live without any false pretenses. i am sorry that you have to hop on to some other nation every three months just so you can continue to stay there. It just doesn’t make sense to me. Can anyone here help you there, like a congressman or something, who could perhaps talk to some of the authorities to let you get your permanent residence there? That would bug me no end.I am glad that the city is beginning to look up. I hope every thing will be more or less done by November, when I plan to come there on my way to India. @ZSA_MD – November would be good timing. I think my parents will be here around then, too! As for the visa, unfortunately all the lawmakers can do is pass a law overturning the Defense of Marriage Act or include domestic partners / civil unions in the immigration reforms. @christao408 – No kidding. *sigh* It would be nice if you and Tawn moved to KC though! :DOr Omaha? !